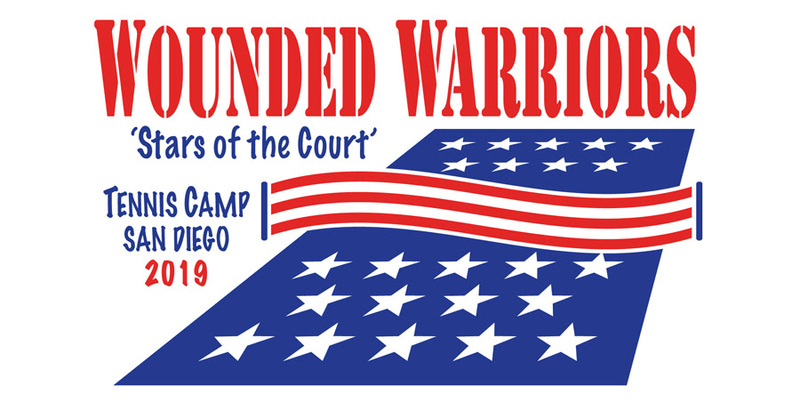 The eighth annual National Wounded Warrior Tennis Camp will take place May 6-9, 2019 at the Balboa Tennis Club located at 2221 Morley Field Dr, San Diego. The camp, which will offer on-court sessions from 10am to noon and from 1 to 3pm each day, will focus on helping participants improve their tennis skills through game-based clinics and instruction in an upbeat, fun-filled atmosphere. The camp also provides participants with emotional benefits and helps with community re-integration. Fundraising efforts are currently underway to help cover all participants’ airfare, lodging, meals, transportation, tennis equipment and instruction. The San Diego District Tennis Association is accepting contributions through its 501(c)(3) fiscal agent, Tennis Lovers For Charity, which are tax deductible. Checks may be made to “Tennis Lovers for Charity” and mailed to SDDTA, 2221 Morley Field Dr., San Diego, CA 92104. About the Wounded Warrior Tennis Program – Since 2009, the Balboa Tennis Club, in collaboration with Naval Medical Center San Diego (NMCSD) and the San Diego District Tennis Association, has provided over 400 free weekly tennis clinics to more than 1000 wounded, ill, and injured service members and veterans from all the military services as part of NMCSD’s Wounded, Ill, and Injured Wellness Division, and the San Diego VA Medical Center’s Recreational Therapy Department. About The Balboa Tennis Club – The Balboa Tennis Club (BTC), which dates back to 1922, was rated as America’s Best Public Tennis Facility by the USTA in 1989. In 2000, the San Diego District Tennis Association named BTC as Club of the Year and in 2003, it received the Outstanding Tennis Facility award from the USTA for large facilities in the United States.